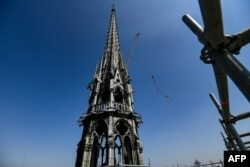 An exhibition of art about Michael Jackson is opening in Germany amid fresh controversy over the singer’s alleged abuse of children. Curator Nicholas Cullinan said Thursday the show at Bonn’s Bundeskunsthalle was conceived long before the recent broadcast of HBO documentary “Leaving Neverland,” which details Jackson’s alleged molestation of two boys. Some radio stations in North America have since stopped playing Jackson’s music. Jackson died in 2009. 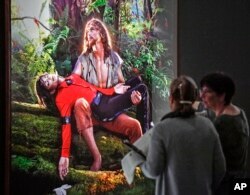 Visitors talk about the picture ‘American Jesus: Hold me, carry me boldly’ from US artist David LaChapelle at a preview of the exhibition ‘Michael Jackson: On The Wall’ at the Bundeskunsthalle museum in Bonn, Germany, March 21, 2019. Ellen Heimes, who heads a local branch of Germany’s largest child protection organization, said the show should prompt a debate about spotting and preventing child abuse.